Civilization 5 mod database gets official distributor. Civilization 5 is one of the premier turn-based strategy titles, with an expansion, Gods and Kings, due later this month. That said, aside from the official expansion, there are also plenty of mods out there, designed by fans of the game who brought their own creativity to the table. Steam has brought those mods to their Workshop, which means that all players now have curated access to the mod database. Steam spokesman Jason Holtman called the move fantastic, and said, "We hope that the Steam Workshop will provide another avenue for the many talented Civ 5 mod creators to have their work seen and played by millions of Civ 5 fans." It works in much the same way as the Skyrim mod community. You can browse, rate and trade mods either directly from Steam, or in-game. Some of them won't work as well as others, but that's what the rating system is for. Tag the stinkers, and praise the well-designed, so that other users won't be led astray. 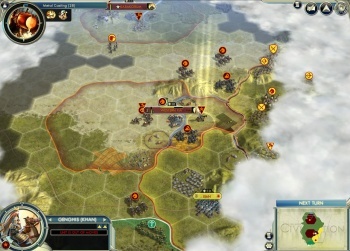 Speaking personally, I like Civilization, but the main game leaves me a bit cold after a while, and I doubt I'm the only one who feels that way. In the past, I've dipped my toe into the murky waters of mod, but wasn't impressed by a Spanish Civil War scenario, which wasn't well put together. Maybe, now that there's a rating system and more content, it'd be a good time for me to get back into the game - and I'm sure it hasn't escaped anyone's notice, either at Steam or Civilization studio 2K, that this announcement, coming as it does just before Gods and Kings, will probably lure a few back in just in time for the new official expansion.